Up to one billion children have experienced physical, sexual or psychological violence in the past year. 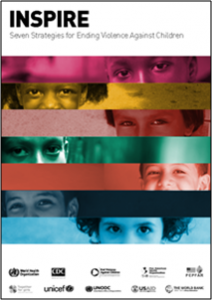 INSPIRE is a technical package for everyone committed to preventing and responding to violence against children and adolescents – from government to grassroots, and from civil society to the private sector. Ten agencies with a long history of galvanizing a consistent, evidence-based approach to preventing violence against children have collaborated to develop INSPIRE. The INSPIRE Core document provides the “what” for each strategy (e.g. objective, potential effects and evidence of effectiveness) while the INSPIRE Implementation Handbook provides the “how” (e.g. theory of change, best practices and costs for each intervention). The INSPIRE Working Group provides a forum where governments, bilaterals, CSOs, professional associations, donors, and UN agencies can: 1) collaborate to achieve collective impact at global and country level; 2) share relevant information on an ongoing basis; and 3) periodically review their joint progress in supporting INSPIRE implementation. *Note that while the implementation and enforcement of laws is an INSPIRE strategy, this funding cannot be used to conduct lobbying activities as defined by U.S. federal tax law. This includes attempts to influence actions taken by legislative bodies (i.e. a bill or act under consideration by parliament, a county assembly, or other elected public body). Organizations applying for funding will also be required to confirm that activities they’re undertaking comply with local laws in the country where those activities are taking place, including laws related to lobbying and advocacy. To enable leaders from Low- and Middle-Income Countries increase INSPIRE awareness and engage civil society and governments at national and regional levels, and from those experiences to actively exert leadership in shaping and driving INSPIRE globally. A total of $750,000.00 USD is available within the INSPIRE Fund for this purpose. Funding is made possible by the New Venture Fund and Ignite Philanthropy: Inspiring the End to Violence Against Girls and Boys. Contracts will be considered in the range of $5,000 USD – $30,000 USD for the purpose described. Priority will be given to local NGOs/CSOs (and local NGO/CSO-led consortia), however, we also welcome applications from other local agencies such as government and academic institutions. Individual applicants will only be considered if they can demonstrate extensive prior thematic and country-level expertise, access to networks and existing relationships. Secondary audience: submissions from International NGOs (or INGO-led consortia) will be considered; however, they should clearly demonstrate how the proposed activities have been designed with local ownership in mind and how local actors will benefit directly. Please register your organization or self by clicking on “Sign Up”. If you are not a U.S. person or entity, please enter “00-00000000” in the Your EIN or International ID field. If you’re applying as an individual, please enter your full name in the “Organization Name” field. After the initial registration, you’ll receive an email to create a permanent password.